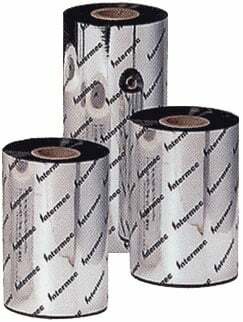 Thermal ribbons compatible with the Intermec EasyCoder 3240. 4.1" x 1500' Black Resin Ribbon. Compatible with Industrial Printers. Single ribbon. Used with polyester labels. 4.5" x 1000' Black Wax-Resin Ribbon. Compatible with Industrial Printers. 24 ribbon case. Used with polypropylene labels. 4.1" x 1500' Black Wax Ribbon. Compatible with Industrial Printers. Single ribbon. Used with paper labels. 2.09" x 500' Black Resin Ribbon. Compatible with Industrial Printers. Single ribbon. Used with polyester labels. 4.094" x 500' Black Resin Ribbon. Compatible with Industrial Printers. Single ribbon. Used with polyester labels. 4.5" x 1500' Black Wax-Resin Ribbon, Compatible with Industrial printers and Polypropylene Labels, rolls/case: 12, Core Size: 1"